With three days to spend in this region, you can get a broad experience that includes Canada's biggest city - Toronto - and the country's most flocked to tourist attraction - Niagara Falls. Several airports are convenient to visit this region of Canada: the city of Hamilton is midway between the two and has a small international airport (code YHM), Buffalo (code YHM) is just across the Canada / U.S. border from Niagara Falls and may offer less expensive flights than the Toronto Pearson International Airport (YYZ). Finally, Billy Bishop Airport (commonly known as the Toronto Island Airport, code YTZ) is conveniently located just offshore downtown Toronto. With three days available, most people will want to spend two days in Toronto and one in Niagara Falls. Whereas Toronto is a big city with a range of interesting things to see, from architecture and museums to shopping and dining, one day is sufficient to take in the spectacle of the Falls and explore the town, which largely comprises tchotchke shops, restaurants, rides, and games. Nevertheless, just next door to Niagara Falls is Niagara-on-the-Lake, a delightful historic town with gentrified heritage homes, lush gardens and an enchanting main drag. In addition, the surrounding Niagara Wine Region is a charming stretch of more than 100 rambling wineries, boutiques, and restaurants, delectable to all the senses. Try to squeeze a stop in at one of these two places on your way to and/or from Niagara Falls for a pleasant contrast to the bigness and boldness of Niagara Falls. For convenience sake, you can stay both nights in a Toronto hotel. No need to move hotels, but if you did happen to have three or more nights to spend in the area, a night in Niagara Falls or Niagara-on-the-Lake would be a nice change. Your Toronto itinerary keeps your day to the downtown core, with most attractions and activities no more than a 10 or 15-minute subway ride, or 30-minute walk, away. Have breakfast either at the hotel, grab it on the run at a Tim Hortons, Starbucks or sit down at the Sunset Grill, for a standard breakfast at a reasonable price. Get oriented to Toronto with a hop-on, hop-off bus tour: great value for a short stay as your ticket includes transportation and a narrated guided tour of the city. Book a Toronto Hop-On, Hop-Off Tour with Viator. This tour's first bus leaves from Yonge-Dundas Square and the pass is good for three consecutive days. Stay aboard for the full two-hour tour, or if you're itching to tackle Toronto, hop off at one of the 21 stops, which include many of Toronto's top attractions, such as the CN Tower, the Eaton Centre, Art Gallery of Ontario, Casa Loma and the Royal Ontario Museum. Consult with the guides for optimum planning and when the busses will be stopping at certain locations. Don't miss the boat tour at the Harbourfront, which is included in your ticket. Many visitors buy a Toronto City Pass, a nine-day pass that includes admission to five Toronto attractions, but two days is probably not enough time to get your money's worth so consider carefully before purchasing. Your afternoon activity depends on your interests. If you want to shop (especially if the Canadian dollar is low) consider the Eaton Centre (hop off at Eaton Centre, stop 1 or 17); wander up and down Queen Street, which has an interesting array of shops and boutiques, or head north to empty your wallet at any one of the many high-end Bloor Street and Yorkville stores (hop off at Yorkville, stop 10). If you want to explore a unique, historical Toronto neighborhood, hop off at stop 19, grab lunch at the St. Lawrence Market, and walk over to the Distillery District, a pedestrian-only village comprising the largest and best-preserved collection of Victorian Industrial Architecture. Not a franchise in sight here, so you can't get a Starbucks fix or shop at Gap; it's all one of a kind. If culture is what you're after, the Royal Ontario Museum (ROM) and the Art Gallery of Ontario (AGO) both showcase world-class collections. The ROM is especially known for its unusual dynamic, asymmetrical structure as well as its dinosaur collection. The AGO, similarly, had a widely publicized renovation and stands as one of the city's great architectural masterpiece. It houses an impressive collection of both international and Canadian art. If you spend only a couple of hours at each, you can fit both into an afternoon, but you could easily spend a few lingering hours at either one. The ROM and AGO are an easy 10-minute subway ride or 25-minute walk away from one another. The ROM is close to Yorkville, a high-end, low-rise anomaly in downtown Toronto; the Bata Shoe Museum and the Gardiner Museum of Ceramic Art. The AGO is in Chinatown and close to Kensington Market, one of Toronto's most eclectic neighborhoods. If the CN Tower is on your list of things to do in Toronto, consider making a reservation at 360 Restaurant, a rotating glass pod more than a thousand feet above the ground. The advantage of dining at the CN Tower is that you skip the line and get directly ushered to the restaurant and the food is quite good. Expect to spend at least Cdn $65 to $85 per person (less for children) for a prix fixe menu, which includes admission to the Tower. There is no expiry on your time at the tower with a reservation at the restaurant. If the CN Tower is not a must-see, but you'd still like dinner with a view, Canoe is famous for its 54th-floor view and as one of Toronto's most revered restaurants for more than 20 years. Alternately, try Richmond Station for more casual but excellent food and hospitality. The benefit of doing the hop-on, hop-off tour on Day 1 is that on Day 2, you are free to return to the attractions and neighborhoods that looked appealing but that you didn't have time to visit. Use your hop-on, hop-off bus ticket to make your way to back to Casa Loma, Canada's answer to Hearst Castle, Ripley's Aquarium, or another top Toronto attraction. If you're looking for a casual, more authentic Toronto experience, try meandering one of the city's many interesting neighborhoods, like Greek Town, Little Italy or Cabbagetown. Just let the look of things and your own interests dictate your journey and they all feature outstanding restaurants for lunch or dinner. Let it be said though that whether you want fish and chips, ramen or a five-star steakhouse, you'll find it in Toronto and probably not that far away. If you still have life in your after dinner, discover why Toronto is a top theatre destination. It's not just because it probably costs way less than NYC or London, but also because the city has a wide array of interesting, historic theatres that attracts big names. If you're still seeking a bird's eye view of the city, make your way over to the Roof Lounge at the Park Hyatt or the One Eighty (right across the street), both of which boast panoramic views of the city. Start your day bright and early. With 3 hours of driving ahead of you, you'll want to get on the road early. If you are in Toronto mid-week, traffic can be a beast getting in and out of the city. Though the waterfalls themselves (Niagara Falls actually comprises three waterfalls, the American, the Canadian and the more meager Bridal Veil falls) are the big draw, there's a whole lot else going on in the Niagara Region, so you'll want to devote a full day: 8 hours minimum, considering the drive each way is 90 minutes. If you have your own car, follow directions for getting from Toronto to Niagara Falls. If you are a wine enthusiast or just to take in some striking scenery, allow time to visit the Niagara Wine Region just off the highway on your way to Niagara Falls. The wine route is well mapped out and plenty of signs will show you where to exit to visit any one of the more than 100 wineries. When you arrive at the Falls, you'll see lots of green "P" parking signs; however, the best deal that is still super convenient is a large parking lot at the end of Robinson Street. You will need to descend a long set of stairs to Victoria Park, at which point you are in the heart of the action. 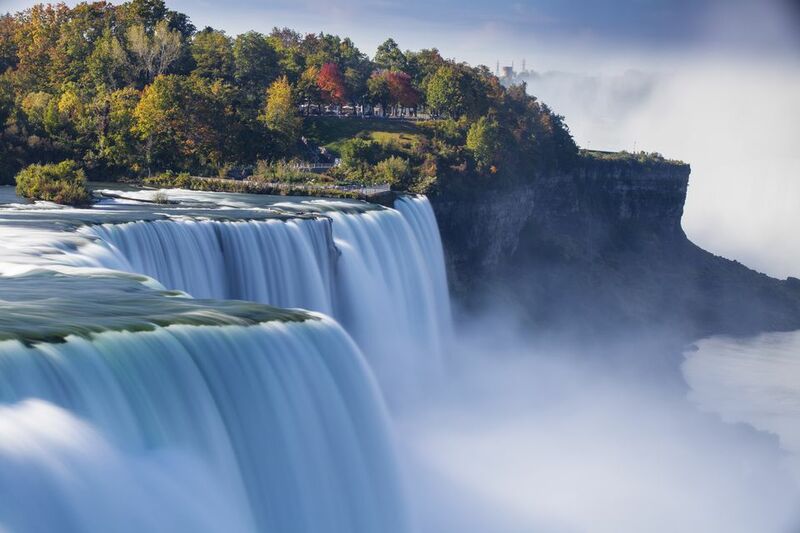 If you would prefer to sit back and let someone else do the driving, there are a number of tour options that leave out of Toronto for Niagara Falls. Some will include visiting the wine region and/or Niagara-on-the-Lake, others will get in and out of Niagara Falls like a military operation. Be sure to choose the right tour, reading the fine print and customer reviews. You'll be naturally drawn to the boardwalk that winds its way along the Niagara Gorge and there's no mistaking which way to walk to see the brink of the famous Horseshoe Falls as you will hear, smell and feel the water spray. If you have kids, you may want to spend some time on Clifton Hill, a bright, bustling cluster of overpriced amusement rides, shops, fast food, etc. After spending about three hours at Niagara Falls, make your way to Niagara-on-the-Lake, a town as charming and cultured as its famous neighbor is big and brash. This is the better choice for dinner as there are several excellent restaurants featuring local wines, meat and produce. Take some time to wander the main street which is gentrified and historic and brimming with delicacy shops, boutiques, and galleries. Some of the best restaurants are located within the many inns and bed & breakfasts scattered about the city. Head back to Toronto or build your plans around leaving departing out of Buffalo (20 minutes away) or Hamilton (about 45 minutes away).